Who doesn't need some extra cash right after holiday shopping? 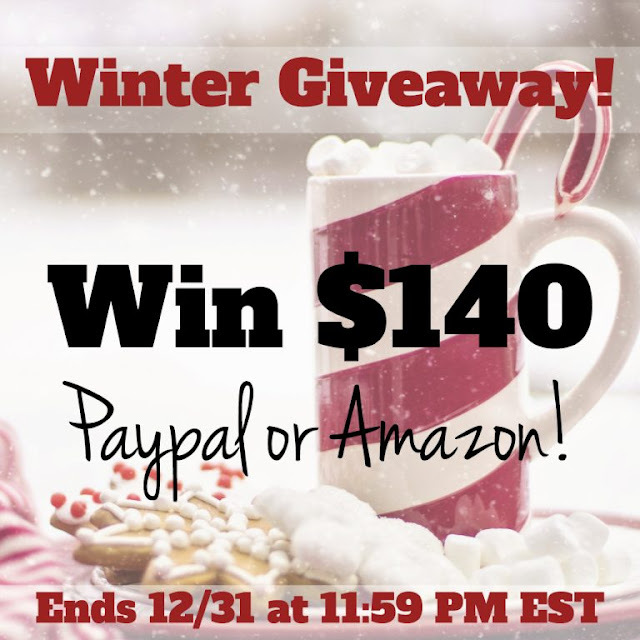 I have teamed up with some great bloggers to host a giveaway. You can win $140 in paypal cash or towards Amazon. Warm and cuddly winter blankets. A new Winter coat. Some mittens and a hat. Maybe just put it towards a bill. I hope everyone has a wonderful holiday. Have fun with your family and friends. I will buy a lot of pumpkin egg nog. Beyond that I haven't really made any plans. I might be nice and share it with the family...or, since I’m getting a Kindle for Christmas, I might have to spend it buying books. I would buy my kids a new bed. :) Thank you for the awesome giveaway. I would buy some new towels,and healthier snacks for our lunches. thanks for the fun giveaway! I would put the cash toward our new-furnace-fund, Brr!